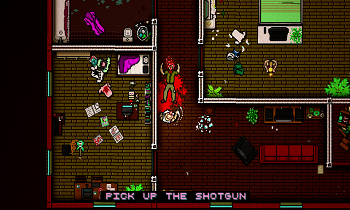 The console version of Hotline Miami 2 will be coming exclusively to PlayStation 4 and Vita. Hotline Miami took PC gamers by storm, delivering addictive gameplay wrapped in hyper-violent packaging that also managed to deliver an interesting story, nifty retro visuals, and an atmospheric soundtrack. It was no surprise then to find many gamers excited by Sony and Devolver Digital's announcement that the game would be making its way to PlayStation 3 and Vita. The PSN version would, in turn, go on to earn accolades from critics and become one of the service's best selling titles for the month of June 2013. That being the case, it was probably safe to assume the game's sequel Hotline Miami 2: Wrong Number would also be receiving a port to PlayStation platforms at some point in the future. Now, Sony has confirmed it. The reveal came at Sony's Gamescom 2013 press conference where the company announced that the follow-up to Dennaton Games' action title would be seeing a release on both PlayStation 4 and Vita. It was also confirmed that the console version of Wrong Number would be exclusive to the PlayStation platforms, arguably giving Sony another notch it can add to its indie belt. Again, we're not surprised, but we are excited. While the PC version was excellent, the portability of the Vita version definitely was, in some ways, a better fit. Assuming the second game is as good the first we'll be keeping some space on our memory cards open in anticipation.